How to encourage interactivity and student participation in a lecture class ? Interactivity can help students learn more during their time spent in large lectures. This article focuses on one interactivity technique in particular, called Think-Pair-Share, to show how students can become more active learners. Large lectures are not a place of unidirectional transmission of knowledge anymore – knowledge professors and students generate knowledge together. Large lectures can be interactive, no matter how large the student population. Thus, a course built while making sure that students participate increases learning effectiveness during class time. Indeed, research suggests that the traditional lecture is far from optimal: students tend to understand concepts better when large lectures are interactive and when students are put in the situation of active learners (e.g. Crouch & Mazur, 2001 ; Hake, 1998 ; Lorenzo, Crouch & Mazur, 2006). Although this research tends to deal mainly with science courses, some research conducted on interactivity in the social sciences and in humanities also show an improvement in student learning (e.g. in sociology Mollborn & Hoekstra, 2010). Several techniques exist to make a large lecture interactive. One of them is from the collaborative learning toolkit, and is called “Think-Pair-Share”. During the lecture, the professor asks a question. Students first think about the answer on their own, then the professor instructs students to compare their answers with their neighbors. Students have to explain to their neighbor why they answered the way they did. Finally, students are asked to share their answers with the whole class, for instance through a voting mechanism. I have been applying this technique in a large lecture in microeconomics. I find that there are five main advantages of applying this technique. Students like it and they tend to follow along quite well. Students are active, and they are able to experience for themselves whether they actually understood the course material or not, because the technique forces them to think and apply the concepts. Students learn very well when they collaborate with their peers, because they can explain concepts in a different way than professors, without suffering from the “learning curse” which is unavoidable for professors. The learning curse refers to the fact that it is very hard for someone who knows something to put themselves in the shoes of someone who does not know yet, i.e. to understand what it is like not to know (cf. this explanation by Steven Pinker, psychology professor, at the 31st minute. I can see for myself what concepts the students have a harder time understanding. I can therefore adapt my teaching, for instance by going over essential notions for which students need a better understanding. The technique interrupts the course’s monotony, and it helps to divide the main lecture in different learning sequences. 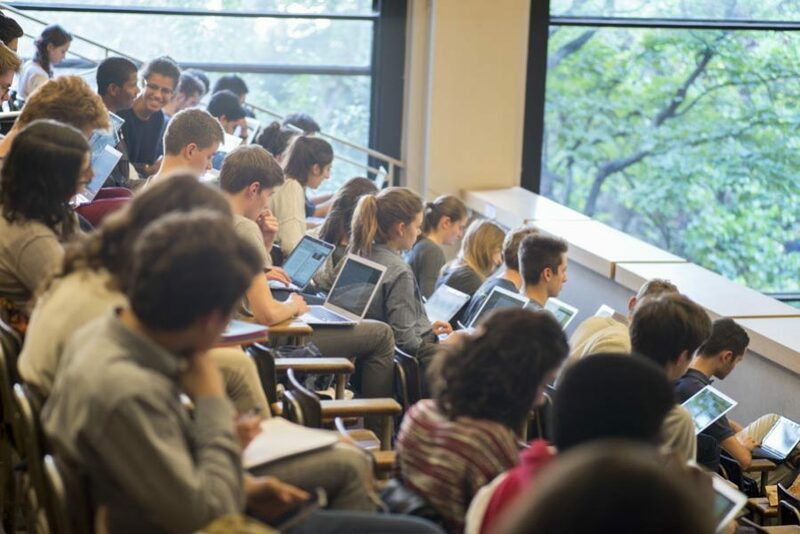 This type of active learning strategy can take up some time on the lecture, but the increase in student attention actually helps to save overall learning time. The benefits are larger than the costs. Physics professor Eric Mazur is well-known for having developed active learning strategies in large lectures: his pieces of advice are very useful. Also, in a widely cited 1993 article, Alison King, Educational Psychology professor, suggests other active learning techniques that can be introduced in a large lecture. These methods all have the advantage of making students active during class. Researchers Tara Gray and Laura Madson (2007) also give valuable tips to make a lecture interactive. Finally, in another article, I’ll write about using instant response systems (such as clickers), which are also extremely useful to increase interaction (e.g. Régnier, 2013). Have you thought about moments in class where you could implement active learning strategies? What active learning activities would be most appropriate for the learning objectives you have for your students? Gray, T., & Madson, L. (2007). Ten easy ways to engage your students. College Teaching, 55(2), 83-87. Lorenzo, M., Crouch, C. H., & Mazur, E. (2006). Reducing the gender gap in the physics classroom. American Journal of Physics, 74(2), 118-122. Mollborn, S., & Hoekstra, A. (2010). “A meeting of minds” using clickers for critical thinking and discussion in large sociology classes. Teaching Sociology, 38(1), 18-27. Régnier, N. (2013). Systèmes de réponse instantanée pour une pédagogie active. 21ème Congrès Français de Mécanique, 26 au 30 août 2013, Bordeaux, France (FR).